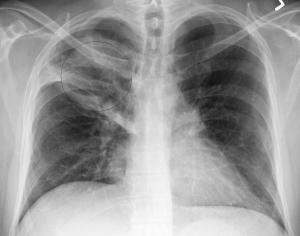 Signs and symptoms of Pneumonia: is Pneumonia contagious? Our body cannot function without oxygen and we receive it through the respiratory system in the breathing process. Oxygen is essential for survival and therefore, every person should pay much attention to the health of the respiratory system. However, it can develop several diseases, among which is pneumonia. Pneumonia refers to the infection of the lungs induced by some of the microbes, such as bacteria or viruses, but fungi and parasites may also cause it. First the upper respiratory tract is infected and then the infection spreads to the lungs. For example, if the cold or sore throat is left untreated, it may expand to the lungs, thus causing the symptoms of pneumonia within two or three days. There are even more than 50 kinds of this respiratory system disease and some of them are mild, but some of them are even life threatening. The elderly people, the people with fragile immune system and infants under the age of 2 are at the highest risk to develop pneumonia. Before the symptoms of pneumonia appear, the person has the symptoms of the common cold, which are followed by cough, fever and chills. In the view of the fact that there are many types of pneumonia, the symptoms quite expectedly depend on the type of this disease of the lungs. However, in all cases, the pain in the chest appears. The most typical symptoms of pneumonia caused by bacteria are pain in the chest, shortness of breath and fever. Furthermore, excessive sweating and coughing up of thick greenish phlegm are also the symptoms of the bacterial pneumonia. The most common symptoms of viral pneumonia are dry cough, headache, exhaustion and pain in the muscles. The phlegm is clear or white. Fungal pneumonia is a very rare type of pneumonia, while so-called walking pneumonia is more common. It is induced by mycroplasma and it causes the symptoms which are very similar to the symptoms of bacterial and viral pneumonia. Many people do not know whether pneumonia is contagious or not, and they are often afraid to be near the people suffering from it. Pneumonia is a very serious disease but it is not contagious. On the other side, the bacteria, as well as viruses that cause pneumonia are contagious. Furthermore, one should know that not all people who suffer from cold will develop pneumonia, but only those with compromised immune system, although this is not a general rule either. Is there a difference between viral and bacterial encephalitis?